Noah’s Sacrifice by BASSANO, Jacopo. 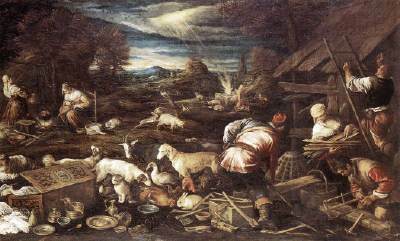 Check the link, it shows a painting by Jacopo Bassano, an Italian painter, depicting a scene of Noah, presumably building an Ark or something I can’t quite tell (and don’t really care, the rest of the scene has my whole attention). 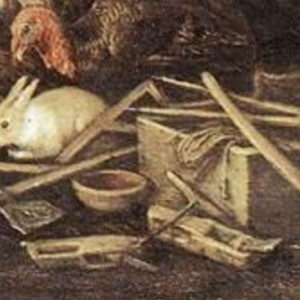 In the lower right corner there are a bunch of tools that the workmen are using scattered about, as well as a simple and more elaborate chest. The planes are of special interest, as they are clearly the style of body found in Pompeii and other Roman finds. Only later than I’m used to seeing. Also it’s interesting because the iron is set so far back in the body. Very interesting. 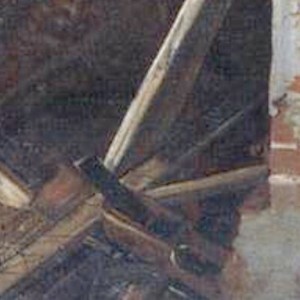 I found the picture through a reference to dovetails in one of the chests, which I can’t make out in the picture. I think it’s a mitre plane or proto-block plane. I’ve often thought that shooting edges would be best accomplished with a plane that has a lo-o-o-ng toe before the iron for registration, like a Japanese plane. But do you see anything like that in western wood working? Only in old pictures like this. Also note the angle–it’s more acute, like 30 degrees. Looking at the picture, you can just make out the ark sitting on the mountaintop in the background, and Noah presumably making a sacrifice at a burning altar (the sun serendipitously shining down on him), while the rest of the family unpacks, prepares a meal, and builds a new home. Just my take from what I saw. The tools are interesting though, especially the plane. I don’t believe it was a block plane, nor a mitre plane. I suppose that the plane was influenced by Asia. After all, it was the expoits of Marco Polo and others from Italy that helped cement the Silk Road, and doubtless that pasta and silk were not the only things they brought back with them that the Italians made their own. The toe of the plane seems to have some deep indentations for grip, leading me to think that it was pulled rather than pushed. Just a thought. Yeah, I noticed the angle, it does appear to be very acute. I’ll bet you’re right on the angle, or close enough. I was looking at the planes of the Mary Rose, and they are all over the map in terms of manufacture since standardized shapes were not quite set yet. The planes showed the individual tastes of the maker. What strikes me is how similar these two are. And that cut out handle in the front screams roman. Although the examples I’ve seen have had the cutout on both ends. I get the real sense of it being a pulled plane too. With the iron bedded so far back like that. You might be interested in the (my) following blogpost on medieval Italian planes of this style. Actually I have made such a plane. It works great.